“The Disaster Artist” tells Sestero’s story of a struggling actor who meets the fearless, eccentric and mysterious Tommy Wiseau through an acting class. The pair decide to move to Los Angeles to try and jump-start their journey to becoming famous actors. They make a pact to always push one another and never let the other give up but when faced with different challenges that test their limits and bring them to the brink of desperation, Wiseau decides that he is going to write his own movie called “The Room” and have Sestero be the star. The movie he wrote turned out to be so bad that the audience thought it was a comedy, and it later became a cult classic. “The Disaster Artist” shows the creation of “The Room” and puts the audience into the mind and personality of Wiseau as he produced the movie. “The Room” is speculated to be an autobiography of Wiseau’s life. The movie follows the story of a banker, played by Wiseau, who is betrayed by his girlfriend when she cheats on him with his best friend Mark, played by Sestero. The audience members were most intrigued with how two different personalities became so close and still share that bond. “There was something so insane and fun about him. Tommy pushed me to do everything that I would not have done. We pushed each other,” Sestero said. Sestero was also asked about the experience of working with the actors in the movie like James Franco, who played Wiseau, and Seth Rogen, who played the script supervisor. He said the cast really enjoyed making the film and were completely on board with channeling their characters. Franco was able to adequately portray Wiseau’s personality, Sestero said, and he recalled talking to Franco on set as if he were actually Wiseau. “I had never seen ‘The Room’ but when I saw that they were screening this movie tonight, my friends and I decided to go and I am really glad that I did because ‘The Disaster Artist’ was really entertaining,” Jasmine Almaraz, sophomore psychology major, said. Many of the audience members had not seen the movie before. 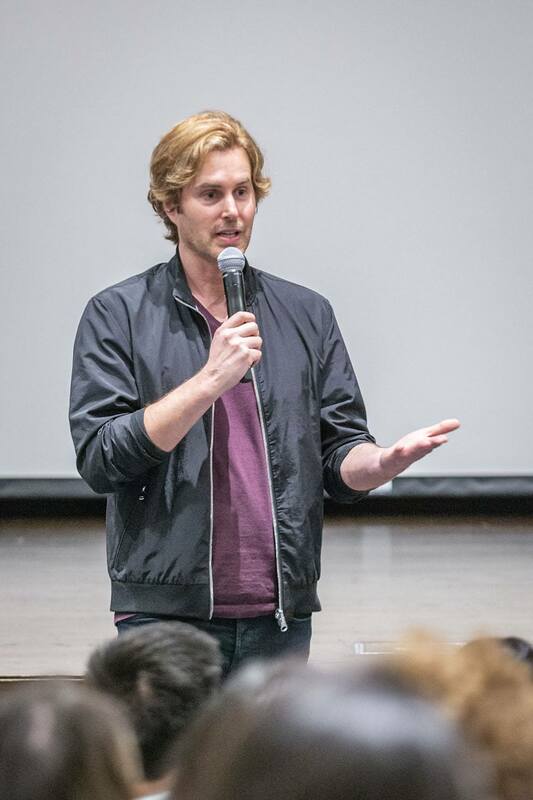 “This was my first time seeing ‘The Disaster Artist’ but I was extremely excited to see Greg Sestero in person and hear him answer our questions. I had a really great time,” said Bryan Parks, Claremont resident. Sestero answered questions about his feelings towards the movie, especially since a lot of the crew members were not professionals. “When we made it, I didn’t think anyone would see it. Tommy pushed forward and it shows that anything is possible,” Sestero said. Stephanie Joseph can be reached at stephanie.joseph@laverne.edu.